Good afternoon. Welcome to the 9th annual State of the City Address in the City of Wheeling. This is my second opportunity to speak to you as Mayor for this event, and it remains my honor and distinct privilege to do so. Let me begin by thanking the people who made this event possible. Thank you to the City of Wheeling Police and Fire Honor Guard for presenting our national and state flags. Thank you, Rabbi Lief, for leading today’s invocation. To my fellow City Council members: Vice Mayor Chad Thalman, Ken Imer, Brian Wilson, Wendy Scatterday, Ty Thorngate, and Dave Palmer – it is an honor to serve the citizens of Wheeling with you. and all the City staff members who are here today. Finally, to the elected officials in attendance, thank you for your dedication to our City, County, State, and Nation. I will begin today by looking back and paying homage to an individual whose contributions shepherded the City of Wheeling through some challenging times. Last year, I hailed former Mayor Jack Lipphardt as one of the pioneers who helped the City weather those economic storms. Today, it is my honor to recognize someone who served alongside Mayor Lipphardt on City Council in the 1990s and whose service to his city and indeed his country spans decades. I am of course talking about this year’s Gateway Award recipient, Barry Crow. Barry is no stranger to public service. As a young man, he served his country on the battlefield in Vietnam. He returned home and joined the Elm Grove Lions Club in 1969, serving twice as its President and continuing to serve on its Board of Directors today. He served on Wheeling City Council from 1998 to 2008, representing the Sixth Ward with diligence, vision, and all-around-general affability. And just last year, he stepped down from the Wheeling Planning Commission after nearly 19 years of service. Barry is also a founding member of the Elm Grove Business Association, a four-term Commander of the Legion of Honor with the Osiris Shrine, an ordained deacon at Stone Presbyterian Church, and, perhaps most importantly, the husband of 53 years to his lovely wife Joyce, the father of two, grandfather of four, and great-grandfather of one. 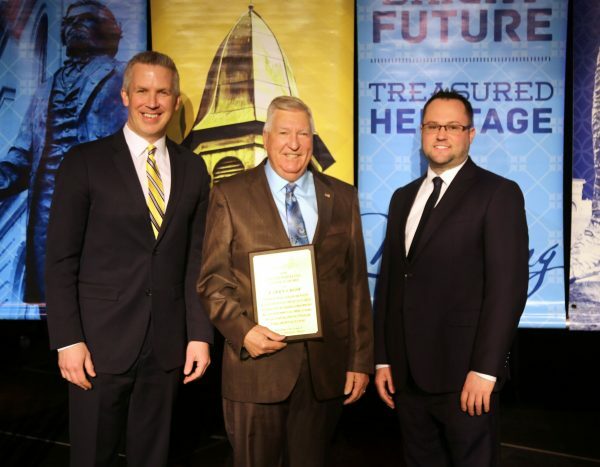 Barry, your dedicated service and contributions to the City of Wheeling speak for themselves and have made you an integral member of our community for decades. Thank you. 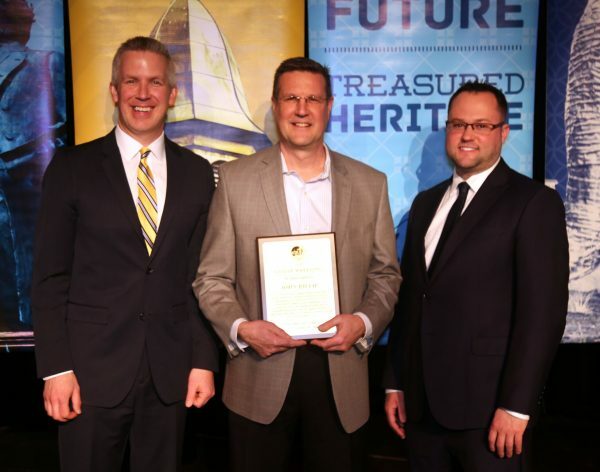 Please join me in congratulating Barry Crow, the 2018 Gateway Award recipient. It is hard for me to believe, but in less than four months, this City Council will have reached the halfway point in its current four-year term. As we approach that milestone, let us take stock of what we set out to do, where we are today, and where we would still like to go. Along the way, let us also pay tribute to some of those who have played leading roles in moving the City of Wheeling forward. In July of 2016, this City Council took office making a firm commitment to inclusion, engagement, and transparency. We moved quickly to take advantage of modern ways to communicate with residents. With the help of City staff, we now manage Facebook groups for each of the City’s six wards. These online forums have provided residents with a convenient vehicle to ask their Councilors questions, to bring issues to our attention, to communicate with each other, and, yes, to air their occasional grievances. They have also served as a useful tool for City staff and members of Council to share ideas and information. We also haven’t forgotten about traditional media. 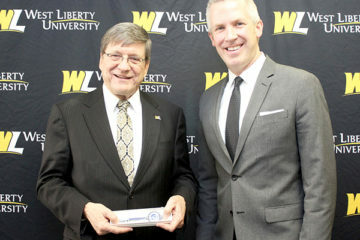 Thanks to our recent partnership with West Liberty University Television, City Council meetings are now recorded and televised locally on Channel 14. And soon, they will be available for viewing on the City’s website. That’s right, you heard me correctly. The City’s new website is nearly ready for prime time. While originally slated for release last Fall, we made the decision that getting it done right was more important than getting it done quickly. The good news is that the extended project timeline has allowed for even more functionality. The site will feature a new meeting calendar and agenda management system to make it easier to stay current with City Council matters. There will be options to submit forms online, sign up for boil order alerts, and so on. The site will integrate GIS mapping technology for easy access to information. And thanks to the ongoing efforts of our new City Clerk BJ Delbert to digitize City records, important documents will be more readily accessible and keyword searchable. In short, stay tuned. The finish line is near. While still on the topic of community engagement, let me pause to recognize one of today’s honorees. 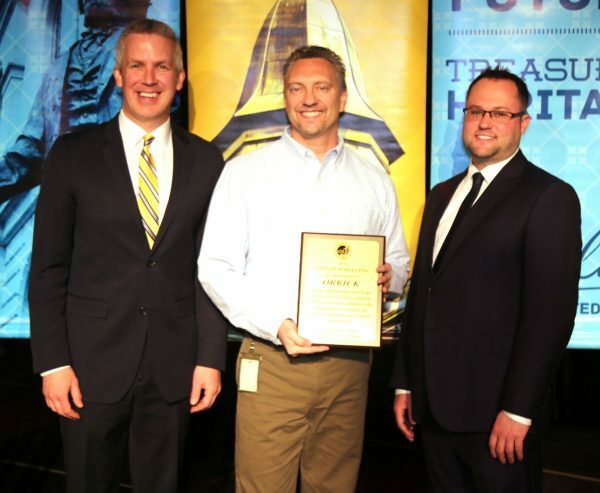 For the past 16 years, Orrick has been recognized as an anchor for our local economy. We all know the story of how it saw an opportunity to collaborate with City partners to turn the then-vacant Wheeling Stamping Building into the first global insourcing center within a major U.S. law firm. We all know about the hundreds of high-quality employment opportunities that this investment created. But it is Orrick’s commitment to not only being in Wheeling but also engaging with Wheeling that truly sets it apart. And that commitment begins at the top. After serving as Wheeling’s City Manager, Will Turani joined Orrick as the Director of Global Operations and Sustainability. Through his leadership, Orrick has generously contributed to bettering our community. It was Orrick that signed on as the key sponsor of the very successful crowd-funding event, Show of Hands. It was Orrick that sponsored community beautification through its Pride in Wheeling program. Time and time again, Orrick has demonstrated that it is willing not only to write the checks but also to show up ready to work. Thank you, Will, for all that Orrick has done and continues to do for Wheeling. We have seen similar acts of community engagement at the neighborhood level. In the Sixth Ward in particular, John Billie deserves recognition. Shortly after being elected President of the Elm Grove Business Association, John planned a successful volunteer cleanup effort. Today, thanks to his leadership, the EGBA has a committee focused on beautification that serves as a model for public-private partnerships. And John’s impact extends beyond Elm Grove. He is genuinely concerned for the welfare of local residents—particularly youths—who have turned to drugs. John has led fundraising efforts to bring Chris Herren—a powerful voice in the recovery community—to the Ohio Valley to speak to local students about his own addiction and recovery. John, we thank you for your efforts to better the City of Wheeling. You set a great example of stepping up to meet the needs of the community. One of the traits that runs throughout today’s honorees is humility. That certainly applies to Amy Jo Hutchison. As the Northern Regional Organizer for Our Children Our Future, Amy is on a mission to end childhood poverty—an unfortunate reality for nearly one-third of West Virginia children under age six. Amy is driven by personal experience to fight against the stereotypes of poverty and advocate for equity across socioeconomic lines. 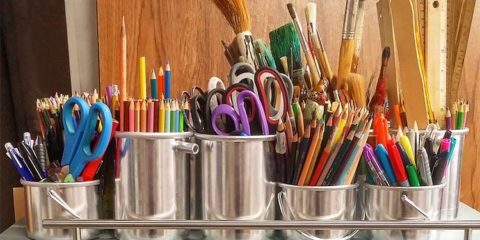 Through the Ritchie Elementary PTO, Amy works to provide opportunities for children who may not otherwise experience the world around them. Through WV MOMentum, she provides a platform for mothers in low-income households to be activists for social change. Amy, you are a tireless servant, a critical voice, and a strong asset to our community. Thank you. My next honoree is a recipient of the prestigious Legion of Honor Award from the Chapel of Four Chaplains. This recognition is reserved for those outstanding members of society whose lives model generosity and service. Pat Duffy, you regularly demonstrate why you are deserving of such recognition. Your efforts to honor veterans through Wreaths Across America, the Veterans Day 10K, the Ohio Valley 9-11 Memorial, to name just a few examples, are to be commended. As are your efforts as a member of the Wheeling Elks Lodge #28 to bring the City of Wheeling national recognition. Pat, with your commitment to those who have served our country, by extension, you also perform a great service to your city. And we thank you for your efforts. Visitors from around the world could tell you about my next honoree, Good Mansion Wines. Good Mansion operates as a direct U.S. importer of Italian specialty food products and offers the State’s largest variety of wines, imported cheeses, and salumi. 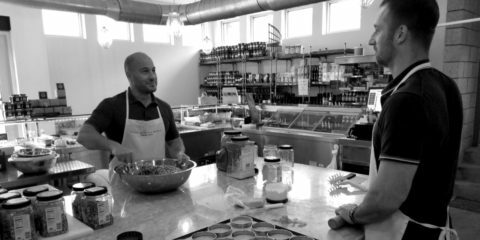 Following a $500,000 expansion, proprietor Dominick Cerrone introduced Wheeling to homemade French desserts, pastries, and breads, Italian coffee drinks, and European-inspired sandwiches. But perhaps even more notable is the role Good Mansion Wines has played in the East Wheeling community since its founding in 2006. By opening his business in the historic L.S. Good Mansion, Dominick took a chance in a neighborhood where others had passed. His success has helped redefine what is possible not only in East Wheeling but also Wheeling at large. Thank you, Dominick, for believing in our community and for your continued commitment to making Good Mansion Wines a cultural destination. Lara Graves and Phillip Kendall also know what it is like to take a chance on a property. Before opening Avenue Eats on Washington Avenue five years ago, the now co-owners searched tirelessly for a space where they could offer fresh food in an inviting atmosphere. They set their sightson the corner of Valley View and turned a vacant building into a unique eatery. The food speaks for itself, as do the awards, which include Top 33 Burgers in America, Best Burger in West Virginia, and the Top 101 Unique Places to Dine in West Virginia. With the recent addition of WHISK bakery+catering, these complementary businesses are thriving. Lara and Phillip, I am confident these first five years are a preview of your future success, and I look forward to what is next for you. Let’s now shift focus from one of our newer restaurants to one of our oldest. Figaretti’s is a long-standing staple in our community with a legacy dating back to 1944, when Sicilian immigrant Anna Figaretti began making spaghetti sauce for her neighbors. It wasn’t long before these efforts transformed into a family business. Currently under third-generation ownership, Figaretti’s was recently voted Best Italian Restaurant in West Virginia, proving that when it comes to great food, newer is not always better. Sometimes, the secret is to figure out what works and then keep doing it at the same level of quality. For Figaretti’s, that formula has been a tried-and-true combination of its famous sauce, a cozy environment, and friendly service. To Dino and the Figaretti family, thank you for commitment to our community. If these last 73 years are a preview of your future success, watch out Wheeling! Today’s final award has been a State of the City tradition for 7 years. 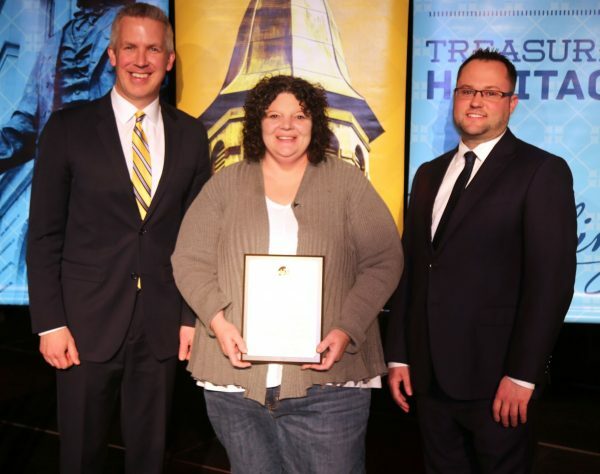 The Community Spirit Award has been reserved for citizens who embody civic engagement and who bring pride to our community through their service, generosity, and general love of Wheeling. Last year, it was my honor to recognize the late Bill O’Leary. Coincidentally, this year’s recipient was a high school classmate of Bill’s. Ladies and gentlemen, it is my privilege at this time to honor Margaret “Peg” Brennan with the 2018 Community Spirit Award. A former history teacher, Margaret has spent decades taking history out of the classroom and sharing it with our community. 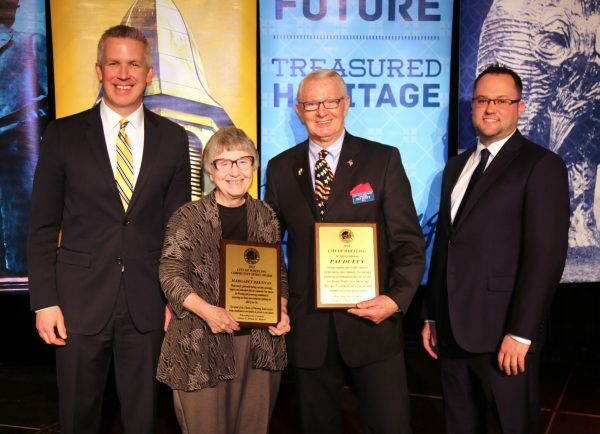 Her wealth of knowledge of Wheeling’s history has made her an invaluable resource and recently earned her a place in the Wheeling Hall of Fame. Margaret is described as the consummate historian, always with a camera and steno pad in hand. Her knowledge and dedication are matched by her thoughtfulness. I am sure many of you have received a handwritten note or custom Wheeling card with a photo from the last time you saw her. I know I have. Indeed, I had to start a separate folder just of her letters. Margaret’s passion for Wheeling and unwavering commitment to preserving our history and our architecture epitomize the spirit of the Friendly City. On behalf of the citizens of Wheeling, thank you for your timeless contributions. By studying our past and documenting our present, you have made an incalculable gift to our collective future. Before moving on, let me once again thank all of today’s honorees for making Wheeling a better place in your own unique ways. Just looking around this room, it is a terrific honor to be surrounded by so many people who love to serve our community. If this gathering is any indication, our future looks very bright. I would be remiss not to take this opportunity to issue a call for candidates interested in civic engagement. The City Manager, City Clerk, and I have assessed the membership of the City’s various boards and commissions, and tomorrow, we will be distributing the list of openings. We are committed to inviting new voices to the table to fill current vacancies and look forward to engaging even more residents. To those critics, let me say this: First, we in city government are always looking for ways to bring more jobs to our community. Our efforts to improve quality of life issues are done in addition thereto, not in lieu thereof. Second, there may have been a time when having available jobs was all a city needed to thrive. But that time has long passed. I have had conversations with many of the City’s employers, large and small. If there is one recurring theme that has emerged, it is this: They are finding it increasingly difficult to fill positions locally—particularly skilled positions. Why? Because the workers who might fill those jobs have been leaving the Ohio Valley for several generations now. Where have they been going? Increasingly, it turns out, many are seeking mid-size and larger cities that not only have available jobs but that also meet their quality-of-life expectations. Indeed, if you look at national Census trends, you’ll note that only eight states lost population between 2016 and 2017. Yes, West Virginia was one of those states. In fact, all but one of those eight states are predominantly rural. That tells me that people are moving to states with larger urban centers. 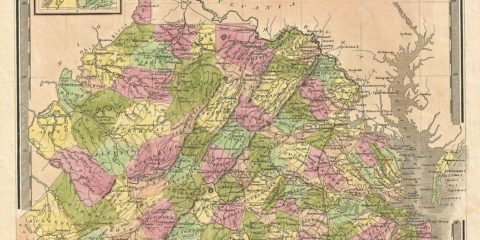 It says that states like West Virginia without any large urban centers need to start thinking outside the box to attract and retain talent. And it says that here in Wheeling, we must take steps to overcome negative perceptions that plague our State and the Rust Belt generally. We must further reimagine and repurpose Wheeling as a small city that offers big-city living. Towards that end, this City Council has been committed to restoring vibrancy into our Downtown business district that over the past few decades had come to be seen as a place that used to be something better. To be fair, two of the most exciting developments in Downtown Wheeling in decades were already well on their way to completion when we took office. Last year’s opening of The Boury Lofts—and its now-lengthy waiting list—proved that when it comes to downtown living, if you build it, they will come. And let us not forget that a little over a month ago, Downtown’s 30-plus-year streak of no new private-sector construction came to an end at the ribbon cutting for The Health Plan’s beautiful new headquarters. This state-of-the-art facility is more than a new building; it’s a bold statement about what is possible in a City looking to the future. 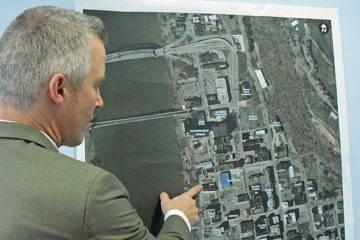 For Downtown Wheeling, the question is no longer if. It’s when. Our charge is to help facilitate the type of development that fills in the missing pieces and advances the decades-long reinvention of our Downtown as a place where people can live, work, and play. From the time we took office, we recognized that our rich stock of historic architecture was a non-renewable resource. 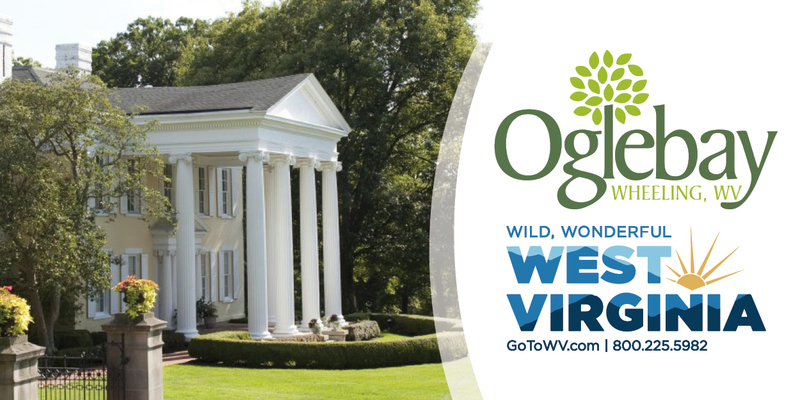 We worked closely with the State Legislature to increase West Virginia’s historic tax credit. Since its passage late last year, we have worked with prospective developers to find solutions for some of our most historic buildings. As we gather today, workers are busy preparing the 113-year-old Wheeling Pittsburgh Steel building for a major overhaul into a first-class apartment building. I can say with certainty that other properties in and around our Downtown are being evaluated by prospective developers each and every day. To complement the ongoing private development, we passed a Downtown Façade Improvement program last year that has shown some early promise in giving building owners matching funds to improve the exterior appearance of their properties. 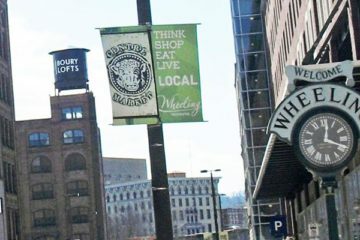 We have helped Wheeling Heritage install banners that create a true sense of place. We have formed a committee to focus on strategies to enhance Heritage Port as a regional destination location not only for pedestrians but also for the boating community. And we have insisted on thinking about Downtown Wheeling much more as a neighborhood full of people than a collection of buildings abutting State Route 2. In quality-of-life terms, that means taking off our drivers’ gloves and putting on our pedestrian’s shoes. We have worked diligently with State Division of Highways officials on their plans to replace the existing Downtown streetscape in 2019. Improved signalization, more prominent crosswalks, more suitable landscaping, and a consistent sidewalk texture are all in the works. We have also asked the DOH to consider what might be the least-popular idea in the history of the City of Wheeling: Two-way traffic on Main and Market Streets! Looking around the room today, I can count at least ten faces of people who have told me in person just how moronic they find such a concept. And, lest there be any doubt, I’ve read the letters, emails, texts, and social media comments suggesting the same. Some of these messages are frame-worthy. But let me be clear here that our goal is not to penalize drivers or cause undue congestion. Our goal is simply to slow traffic down just enough to restore the rightful balance between drivers and pedestrians. There is ample scientific data available on this topic. The more people feel comfortable walking through your central business district, the more money they will spend at first-floor retailers. Walkability matters. Cities across the country are converting one-way streets back to their original two-way configuration; almost none are doing the opposite. The implication is clear: You want people to drive to your Downtown, not through your Downtown. And we have also looked at quality-of-life issues from a city-wide perspective. We approached Uber officials early on knowing that ride-sharing services are no longer seen as luxuries but rather as essential ingredients of city living. At first, Uber declined our invitation. 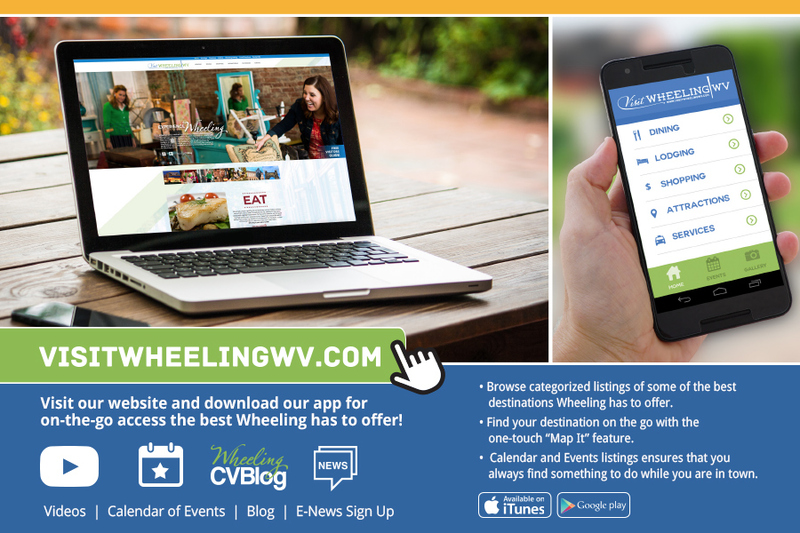 But after several months of follow-up emails and conference calls, they made the decision last summer not only to come to Wheeling but to come to cities across the State of West Virginia. Locally, Uber service has been well received, meeting expectations for younger residents. It has reduced the extent to which having a car is a prerequisite to having fun in Wheeling. Along the same lines, we have formed a committee to come up with feasible ideas to revamp and expand our outdated recycling program—both because it’s smart policy and because it will help us meet the expectations of today’s workers. We provided the final piece of funding to allow Wheeling’s first dog park—the Fitzsimmons Family Dog Park—to open its gates last Fall. We incorporated Wheeling’s first disc golf course into City-leased property near the Wheeling Island Marina. All these moves are contributing and will contribute to a higher quality of life in Wheeling and will make us more competitive. 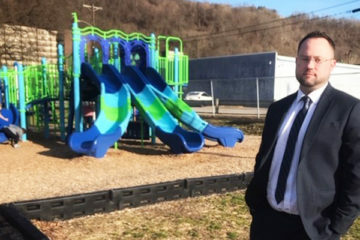 But none of these decisions make me as proud as the way this City Council came together to make the replacement and/or rehabilitation of Wheeling’s 30+ neighborhood parks and playgrounds a top priority. This commitment began in late 2016 as this City Council voted to create a new position of Director of Parks and Strategic Planning. 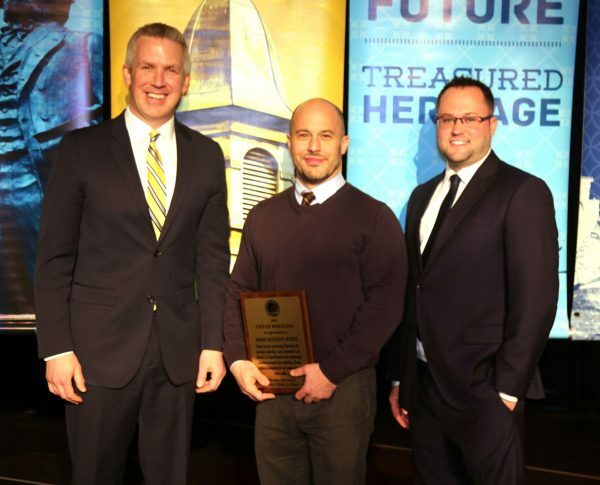 It continued with the hiring of Jesse Mestrovic to that position with a clear message that our neighborhood parks and playgrounds were to be a priority. 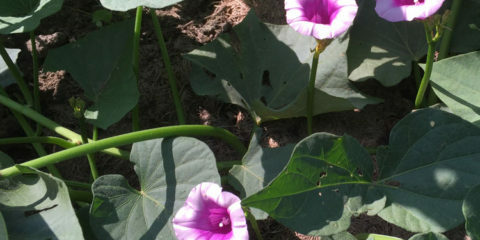 And it has manifested itself several times in the 15 months since as City Council has been asked to set aside funding for parks and recreational improvements. With funding in hand, Jesse has overseen renovation efforts for 7 of our 22 existing playgrounds, including Patterson, Mozart, Bridge Park, and four Community Development Block Grant-funded playgrounds at 25th Street, Wilson, Jenson, and Grandview. With the upcoming installation at Garden Park this Spring, investments in our playgrounds will have exceeded $330,000. 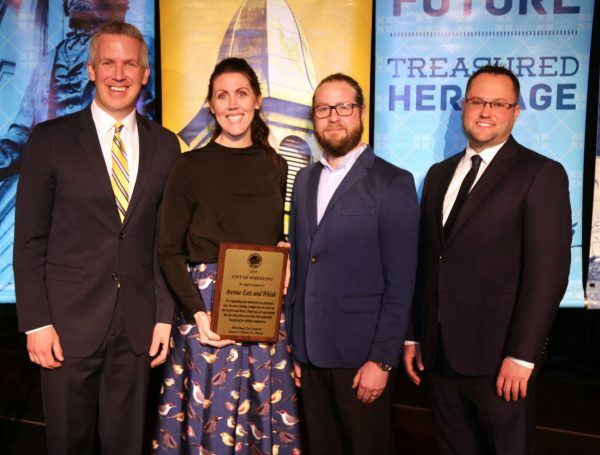 Jesse has partnered with the Community Foundation for the Ohio Valley to facilitate future investments from donors and partners in the private sector. The future is bright for the continued enhancement of our neighborhood park system. We are turning what was a liability into a source of community pride. During my remarks last year, I emphasized that even though public safety has been one of the City’s relative strengths over the years, we must never become complacent or otherwise take it for granted. We must stay one step ahead of the crimes and disasters and accidents that always seek our weakest lines of defense. We must be proactive. As I look at our respective Police and Fire Departments, our strength is fairly obvious: Our people. From top to bottom, we have highly trained first responders, detectives, investigators and others who make Wheeling one of the safest cities of its size in the nation. But we also have one notable weakness: Our facilities. Our Police Department has occupied the same space on the 1st floor of the City-County building since 1959. If you have had a chance to see it—hopefully on a voluntary basis—your first thought was likely just how small and compact it is. In its current configuration, the department lacks adequate space to conduct training, to store evidence, and to store equipment such as riot gear, firearms, and ammunition. The space is not ADA compliant, nor does it have a women’s restroom for female employees. Unlike many police departments, it has no locker room, workout room, or break room. In short, this space leaves much to be desired. Though not quite as inadequate, our Fire Department headquarters is starting to show its age and lack of functionality as well. It has been housed in the lower levels of the Centre Wheeling parking garage since the 1970s. During that span, departmental responsibilities have expanded, as have storage needs for hazmat, water rescue, EMS, and Scuba gear. Both of these departmental headquarters are located multiple blocks away from easy Interstate access. Neither have secured parking. From the conversations I’ve had with multiple first responders as well Chief Schwertfeger and Chief Helms, it’s clear to me that securing improved space would benefit not only departmental functionality but also employee morale. To this end, I intend to ask City Council to in turn ask city voters this November to approve a tax levy for the construction of a new public safety building on City-owned property in Downtown Wheeling. Ideally, such a location would provide convenient access to I-70 and State Route 2. While many of the specifics for design, location, and ultimately cost are moving targets at this point, please stay tuned. What is clear to me is that the status quo cannot be defended if we are to keep public safety one of our shared community priorities. With our time together today running short, let me just briefly touch on some of the other exciting developments taking place in the City of Wheeling. It was a week ago today that the Mountain East Conference announced that it will be bringing its annual mens and womens basketball tournament to WesBanco Arena in 2019. This announcement didn’t just happen—it was the result of many months of hard work by a who’s who of city partners. But more than anyone, it was The Health Plan stepping up and agreeing to be the lead sponsor of this tournament that helped us close this deal. It will be very exciting to see MEC basketball come to Downtown Wheeling. In the coming months, work will begin on roughly $4 million of structural and cosmetic improvements to the City’s Center Wheeling Parking garage. The good news is that because OVMC is now owned by a for-profit entity, we were able to utilize tax-increment financing to protect other City taxpayers from having to foot the bill for these long-overdue improvements. Over the next year, the City has committed to working with local property owners to finance and erect a new parking garage just south of The Health Plan. While the specifics of any deal remain far from finalized, there is a strong desire on all sides to come to a consensus. Such a parking structure is a critical for development of the nearby Wheeling Pittsburgh Steel building as market-rate apartments. It’s also critical to provide capacity for future economic development. Stay tuned. 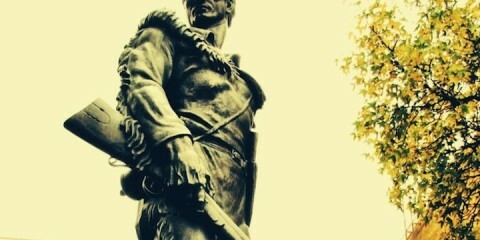 And let us not forget that 2019 will mark the 250th anniversary of Wheeling’s founding. The last time our City experienced such a milestone was our bicentennial in 1969, and the City spent the better part of the year celebrating it. To that end, City Council has created a Wheeling 250 Committee tasked with planning and overseeing a series of 2019 celebrations and commemorations. I could go on, but, I have already taken considerable liberty with your patience. 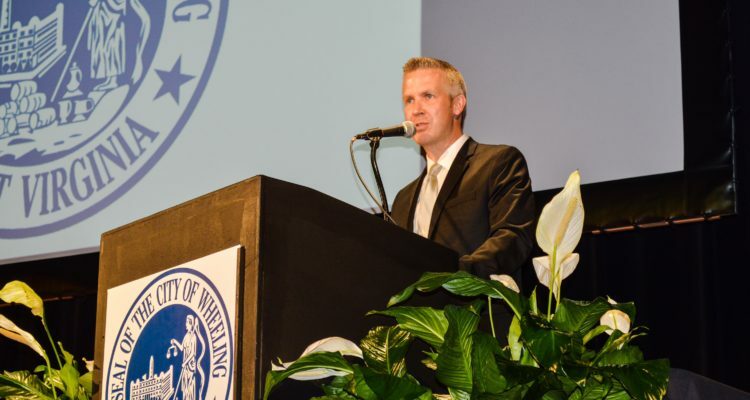 Let me close by stating what I hope is readily apparent to you already: As we gather in March of 2018, the State of the City of Wheeling is strong. And getting stronger every day.